This morning, Sunny Raschke, Jody Neice and I painted during the service at Crosspointe. David-the-Artist-Pastor is teaching an 8-week series starting next week called the Whole Story. Sunny did the lions share of the work, by priming the canvas. Then the three of us got together last weekend and painted the background. 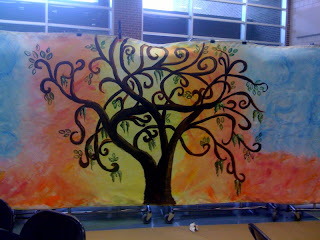 Jody sketched the tree and Sunny painted the first coat of it to get it ready for the service today. HOW DO YOU KEEP UP WITH SO MANY WEBSITES?!?!?!!?!?!?!?!?!?!?!? LOL. Much of the content does double duty. Randomcathy.com is my main site and where most things are developed originally.